Earth's End: Breaking Ground at Earth's End! Above: Ant Sang with the first proof edition of The Dharma Punks. 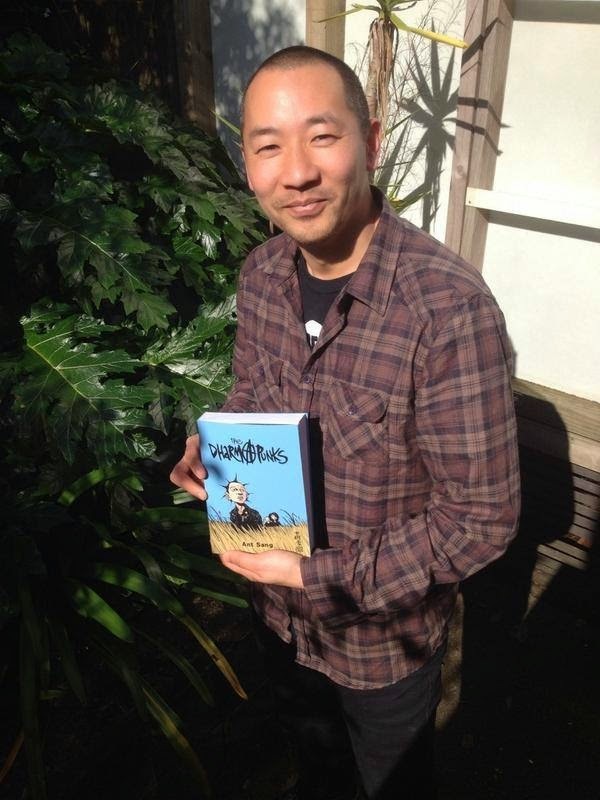 It has been a little over one year since myself and my publishing partners decided to embark on this journey - to bring some of New Zealand's finest comics and graphic novels into print, starting with Ant Sang's legendary comic series The Dharma Punks. New Zealand has a long, proud history of comic book creators. Pioneers like Noel Cook, Avis Acres and Eric Resetar to name just a few - but for much of our country's cultural history, comics have existed on the margins of the art and literary world. Rare treasures waiting for a wider audience to rediscover them and marvel at the wide range and quality of our own homegrown 'funny books'. And while some of them may indeed be funny, they are anything but predictable. Without the publishing industry and infrastructure of our UK and US cousins, our cartoonists have had to travel a different path, and follow their own creative instincts. They don't create comics for an audience addicted to capes and tights or for syndicated glory, but because they have their own stories to tell - and they LOVE this medium. Over the last 20 years we've seen a real resurgence of New Zealand created comics and graphic novels, with outliers like Dylan Horrocks' Hicksville (1998) and Maui: Legends of the Outcast (1996) by Chris Slane & Robert Sullivan, proving that our cartoonists have the talent to create world class graphic novels worthy of a wider audience. And there were comic books that impressed too, like Jared Lane's Progress, Karl Wills' Jessica of the Schoolyard mini-comics, but few were as ambitious as Ant Sang's The Dharma Punks. Tightly plotted out over eight issues, taking three years to complete (2001-2003) - this series was Ant throwing down the gauntlet for a professionally produced local comic book. He planned it out extensively, not just the story and art - but the logistics of making the comic a reality. He secured a funding grant from Creative NZ to work on the series, he lined up magazine distribution to make sure it reached a wide audience, he sought out publicity with a launch exhibition at Alleluia Cafe and promoted the series in magazines and on television. He gave this comic everything he had, and most importantly, he delivered on his promise: by producing a FANTASTIC comic series. 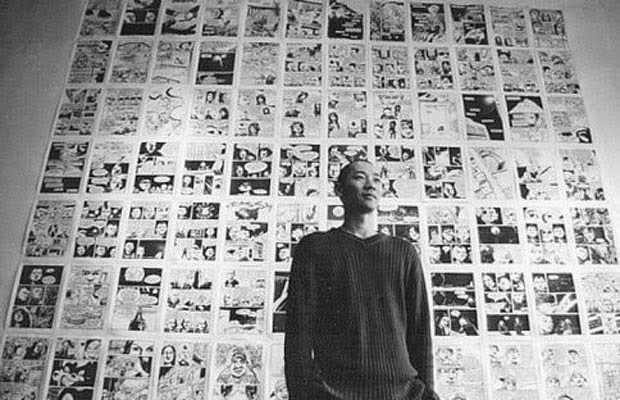 Above: Ant Sang at the launch exhibition of The Dharma Punks comic series at Alleluia Cafe, Auckland, in 2001. And thanks to all his hard work, an audience really turned out. Local comic shops like Gotham Comics, Heroes For Sale and Graphic recommended it to their customers and reported copies outselling US titles like Amazing Spider-Man and Uncanny X-Men; you could find copies at booksellers like Whitcoulls, Boarders and even the corner dairy! It had quickly become a legitimate bestseller. As the months passed inevitably the gaps between issues widened as Ant took on freelance jobs to support his family and to continue to financing the comic - but every new issue was larger than the last, he hadn't lost any of his creative drive to finish the job. And slowly but surely, Ant proved it could be done. By the time the series was finished Ant was snatched up by Firehouse Films to bring the animated series Bro' Town to life. He won multiple awards for his work on the series, and a few years later he made a return to comics with Shaolin Burning, the first OGN published by a major NZ publisher - HarperCollins - in over a decade. Once again he was setting the pace, soon to be followed that same year by an NZ edition of Hicksville and Kimble Bent: Malcontent by Chris Grosz. I followed Ant's example when I wrote and produced From Earth's End: The Best of New Zealand Comics (2013), because I felt it was past time the general public were reintroduced to the great work our cartoonists have produced over the decades. It was a gigantic undertaking, more than one person could possibly wrap their arms (and mind) around, but I did it because it needed to be done, and like Ant I wasn't going to settle for second best. I sought out New Zealand's finest publishing house and the industry's top designers, and they helped me bring our comics back into New Zealand homes. But to me that was always just the beginning, what I really wanted my book to be was a launching point for a whole new era of NZ graphic novels - to see more NZ comics in our bookstores, our libraries and our schools. It seemed to me that there was only one obvious title to kick off this kind of publishing revolution - a collected edition of Ant Sang's The Dharma Punks. I had discussed this idea many times with my good friend and comics writer Kelly Sheehan, who in late 2013 took it upon himself to make this 'wouldn't it be great' idea into a reality. So while I was frantically finishing my book, Kelly set about figuring out the logistics of forming a publishing group and the resources we would need. Early on we approached Damon Keen - the co-editor of Faction Comics to discuss his successful navigation of crowd-funding comics, and we soon found another partner (and gifted designer) for our publishing endeavour. Ant was on board as soon as we brought the idea to him to collect The Dharma Punks, and has been an equal business partner in this venture, going the extra mile throughout our publishing journey (painstakingly re-scanning every original page of the comic available, producing new artwork for the book and Kickstarter exclusive extras). And we can't thank our Kickstarter supporters and Ant's fans enough for making this book a reality. And speaking of going the extra mile: Ant has drawn some AMAZING sketches in the Kickstarter editions - which has taken him an extra few weeks to complete between his work commitments, but I think pledgers will be EXTREMELY happy with the results! 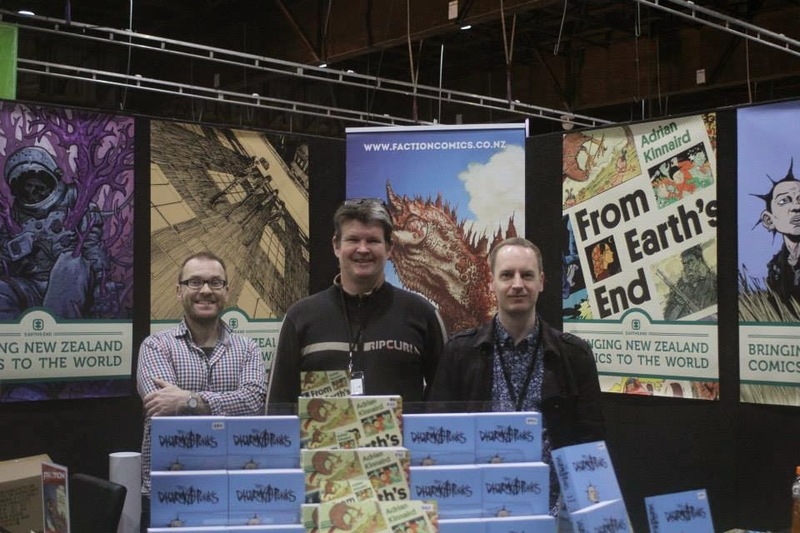 Above: The Earth's End Publishing team at Auckland Armageddon Expo 2014: (from left) Damon Keen, Kelly Sheehan and Adrian Kinnaird. It has been a learning process for all of us here embarking on this new business venture, but it has been a whole lot easier knowing you have an ace up your sleeve - and when the first proofs came back last month, I knew we had something special. Did I mention there's also an introduction by Elizabeth Knox? We've very proud to launch Earth's End Publishing with this landmark graphic novel, and we look forward to bringing more of our local comics to the world.